The first thing you discover at IBC is that TV isn’t dead. It has just morphed into a dizzying array of ultra-confusing solutions … that’s right, everyone has the answer. Take the simplest – screen size. Streaming to the big screen has shown an increase. No, smartphone is the preferred way of watching your stuff. The kids watch nearly everything on their smartphones, including watching 2 to 3 of a series. Me? I’m satisfied watching one a week and maybe 80 percent of the time, on a big screen. Folks were glued to their small screens while riding bikes in Amsterdam–even in the rain. Sure, I wish I was that coordinated at multitasking. But with the rain, it was more comfortable taking the Metro rather than walking (was able to get enough walking in while covering 15 halls). Your Speed – The backbone of global commerce and increasingly, media and entertainment; mobile internet speeds have grown steadily in countries around the world. A number of countries have made significant strides in improving performance to keep pace with today’s mobile viewing habits. Actually, with about two-thirds of the world population having a mobile device, it’s not surprising that Adobe Digital Insights recently reported that the smartphone is driving M&E content consumption. According to Akamai, one of the most popular content delivery firms, the U.K. has the fastest mobile speeds, with an average of 26 Mbps; and the folks in Holland get to stream with a respectable speed of about 17 Mbps. Measuring the mobile Internet speed is important, since mobile (and especially video) consumes a huge share of today’s internet usage. Entertain Me – Today’s mobile devices are increasingly becoming the content viewing device of choice by people of all ages. The device in your hand is the one you turn to first. Of course, our kids were excited when AT&T and Verizon announced their unlimited data plans so they could stream forever on their iPhones (Before you even ask; NO, they are not getting a $1,000 iPhone X. They can play all the guilt tricks they want, they can stick with their 7s.). We also threw cold water on the night/day streaming by reminding them that once you reach a certain usage threshold in those unlimited plans, viewing suddenly becomes painfully slow. While U.S. carriers enjoy making a point that much of the U.S. has 4G and increasingly 4G LTE (long-term evolution) service, it varies widely in most cities and is virtually non-existent in rural areas. So you live with buffering or lost coverage once you step outside. That’s probably why although most kids do stream video to their smartphone, they do it at home. Unlimited Data – For competitive reasons, wireless service providers are offering unlimited data plans, but it doesn’t mean much when they throttle the content being streamed. As a result, consumers quickly find that for flawless, high-quality streaming, it is better to use Wi-Fi for their entertainment. When folks are out and about, they find content just seems to look a whole lot better when they’re using broadband Wi-Fi, rather than their phone company’s service with or without an unlimited plan. 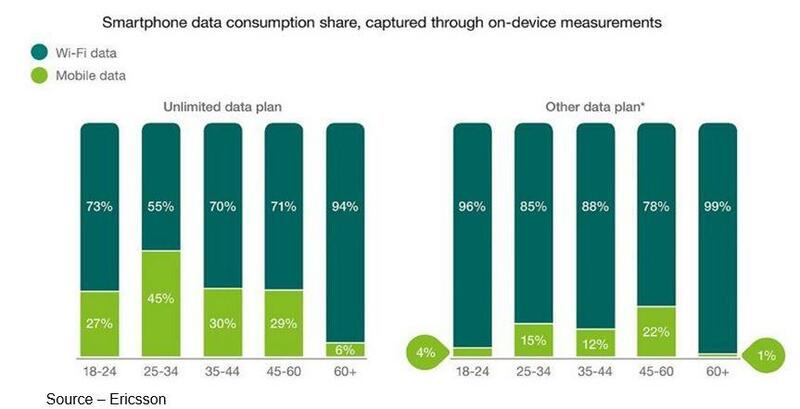 Ah, but by 2025, two-thirds of the global mobile connections will be G4 according to the Groupe Spéciale Mobile Association (GSMA) which represents the interests of mobile operators worldwide. And G5 is just around the corner. What’s so good about G5? Right now, the stuff you’re watching on your smartphone through your mobile service provider is really HD (DVD) quality and according to your telco, that’s … good enough. The exception today is if you’re streaming Netflix or Amazon Prime to your phone because they perfected OTT formulas that are bandwidth conservative but still deliver really great 4K. That’s probably why T-Mobile’s boss, John Legere, jumped feet first into the streaming content field by offering Netflix free, rather than buying a bunch of content producers. Oh, and Open Source recently reported that T-Mobile had pulled ahead in the speed wars and was averaging 17.5 Mbps on average 4G download speeds, compared to Verizon’s 14.9 Mbps. Netflix reported more than 5.2M new subscribers in its Q2 earnings. It will be interesting to see how many new folks they add when they report in October. ComScore reported folks in the U.S. spent about 7.5 B minutes watching Netflix on their phones in June, up 73 percent since 2014. They added that smartphone viewership is growing much faster than other digital platforms. 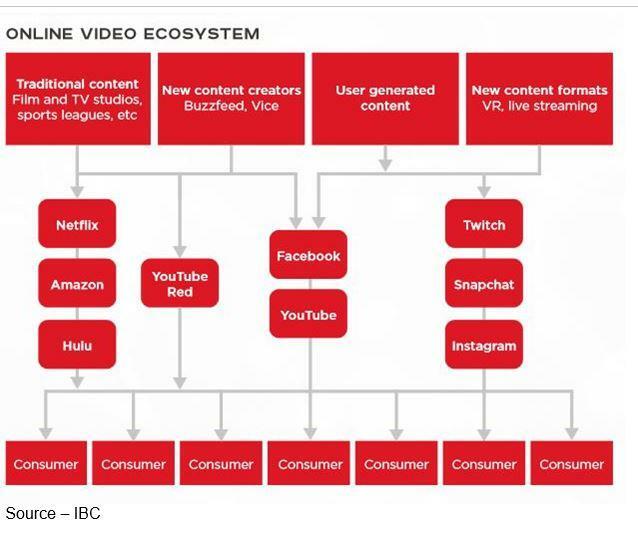 The folks at YouTube and Facebook (with their newly announced Watch channel) will deliver the same high quality because all four of the firms run their own CDNs (content delivery networks) to deliver higher-quality video data streams in their global service areas. But don’t worry, content delivery is going to get better when 5G is deployed. Then, you’ll be able to flawlessly enjoy 4K/HDR (high definition resolution) and VR. If you want to see what it’s going to be like, visit the Olympics next year in South Korea and Japan in 2020. GMSA has already warned us that deploying 5G service everywhere will be slow. Video Dominance – The smartphone allows you to call, text, email and more. That more is increasingly watching video from premium, free and social media sites. Actually, mobile video viewing is growing everywhere, so the Dutch bike riding/smartphone viewers weren’t an anomaly. Netflix and Amazon Prime have set the pace for OTT video content streaming with their subscription services of really great content that the global audience wants. The shrinking audience ratings – among all age groups – means fewer ad dollars for them as the content shifts to anytime, anywhere, any device internet delivery. A few people say it’s obvious that people are shifting their viewing to subscription services, but here’s where we disagree. Yes, we have both Netflix and Amazon; but we (and our kids) also watch a lot of ad-supported shows like news and a variety of ever-changing series. their content, the first choice for teens and pre-teens is ad-supported content. As a result, shorter 6-second ads are increasingly being used by marketing people. They’re not entertaining to watch; but as weird as I am, I actually like some of the ads. The old-fashioned fixed day/time TV bundle is being replaced with a more DIY (do-it-yourself) bundle that includes a selection of subscription and ad-supported content. Of course, that bodes well for Google (YouTube) and Facebook; but it also means a new (more precisely measured/reported) audience for marketers. But as you saw if you were lucky enough to walk the halls at IBC, it hasn’t killed networks, studios and independent filmmakers. It has produced a new, more exciting ecosystem! Growing Ecosystem – With almost everyone in the industry focused on reaching the largest possible (and best) audience, a new ecosystem has emerged as firms work to find the best segment for them to dominate. According to the CTA (Consumer Technology Association), most folks (young and old) have given up watching live TV. Kids were almost born with the smartphone in their hands, so it’s logical that it’s the first thing they would turn to for their entertainment. But even millennials spend 55 percent of their video viewing time after the show has aired. The viewing time has been supplanted by more folks watching through paid/free sites, network websites/apps. The content developers and distributors are beginning to work on ways to economically deliver content to whatever the viewer is watching at the time. They’re not really concerned about a valid business model or if the infrastructure delivers ROI (return on investment) to the ecosystem participants. They just want their content 24/7 on the screen viewers are watching at the time. And I think that’s going to be a healthy mixture of long-form and short-form content. As long as the content is professionally created and presented, it’s all good. YouTube and Facebook are already taking steps to move beyond the cute stuff that populates the two sites to something that has a high degree of professionalism about it. agree because both seem determined to move to the next level of content, more in line with what Netflix, Amazon and studios produce but on the short-form approach to appeal to today’s younger, shorter attention span audience. Undoubtedly, Jeffrey Katzenberg’s activities at the June Allen & Co Sun Valley media finance conference didn’t go unnoticed by the two firms. After selling DreamWorks to NBCUniversal, he was looking for his next great venture and he saw that short-form video was exploding but the vast majority was being done by amateurs. Katzenberg’s solution, which he is slowly launching, is tentatively called New TV, which would fund professional productions created by proven industry professionals. Actually, this isn’t his first rodeo. The producer of over 400 mega-franchise films originally launched a similar project back in 1999 with Microsoft co-founder Paul Allen, called Pop.com. Long before broadband, connectivity was available for the delivery of similarly professional short-form content to the desktop. 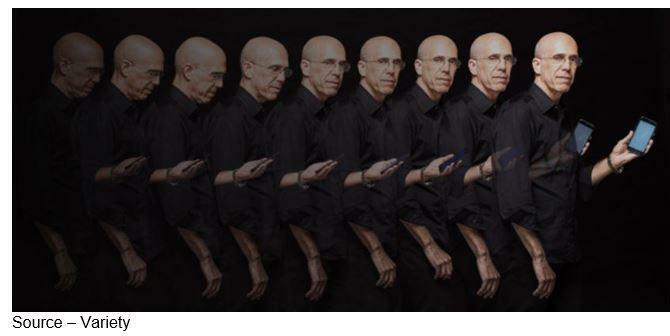 Today, with mobile devices everywhere and high-speed broadband widely available Katzenberg feels the time for professional short-form content is right and many in the industry think he just might be the one to make it happen. On the Move — After selling Dreamworks Animation to Comcast's NBCUniversal, Jeffrey Katzberg set his sights on a smaller venture that could be even bigger–professionally produced short-form content that would appeal to viewers who were on-the-go but who wanted their entertainment in smaller bites. His goal is to develop a growing library of 10-minute video segments that go beyond the normal social media fare. Right now, it's still a work-in-progress, but keep watching your screen. Industry observers note that it took years before TV established itself as its own creative medium and didn’t simply repurpose formats from other media. And Katzenberg isn’t willing to take established genres and cut them down to size – typically 10-minute segments. His approach will be to move mobile video from a state of arrested development that lives on ersatz substitutes to content that is clean, fresh, digestible and monetizable. His new venture is focused on bringing the two worlds together with perfect creative and business alignment. While the industry is already moving to six-second ads, his approach is to have title sponsorships and brand integration, rather than commercial breaks. Before launching New TV, he’s apparently already working to contract for a significant volume of content in a wide variety of genres to suit different tastes. It’s a major undertaking with entertainment targeting 18- to 34-year-olds. The short-form video series will be produced with budgets and production values you’d expect from primetime TV and top-shelf creatives on both sides of the camera. But that’s not to say that Amazon’s Bezos might be a good partner because the company is only now building out its mobile capabilities and Bezos has made no bones about the fact that he wants the best content possible for his service. We’ll just have to see who’s professional short-form content rises to the top the fastest. There’s probably lots of 10-minute time slots to fill for everyone in a 24/7 time period.